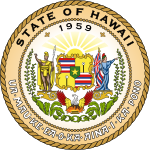 The 2016 United States presidential election in Hawaii was held on November 8, 2016, as part of the 2016 United States presidential election in which all 50 states and the District of Columbia participated. Hawaii voters chose electors to represent them in the Electoral College by a popular vote pitting the Republican Party's nominee, businessman Donald Trump, and running mate Indiana Governor Mike Pence against Democratic Party nominee, former Secretary of State Hillary Clinton and her running mate, Virginia Senator Tim Kaine. On March 1, 2016, in the presidential primaries, Hawaii voters expressed their preferences for the Republican and Constitution parties' respective nominees for president. The Green Party held its convention on May 21, along with its primary on May 28. The Democratic Party held its caucus on March 26. Registered members of each party only voted in their party's primary, while voters who were unaffiliated chose any one primary to vote in. Hillary Clinton won the election in Hawaii with 62.2% of the vote, her highest vote percentage of any state, though a significant decrease from President Obama's 70.55% from 2012. Donald Trump received 30.0% of the vote, surpassing Mitt Romney's 2012 performance by 3%. Hawaii was one of two states where Hillary Clinton won every county, the other being Massachusetts. Hawaii was Green Party nominee Jill Stein's strongest performance, being the only state where she reached 3%. Despite all of Hawaii's electoral votes being pledged to the Clinton/Kaine ticket, one faithless elector voted for Bernie Sanders for president and Elizabeth Warren for vice president. ^ One elector voted for Bernie Sanders for president and Elizabeth Warren for vice president. ^ "Hawaii Election Results 2016 – The New York Times". Retrieved November 29, 2016.